Answer: How many round rooms? Finding the Cliff Palace in Colorado isn't hard. will give you just about everything you need to know. 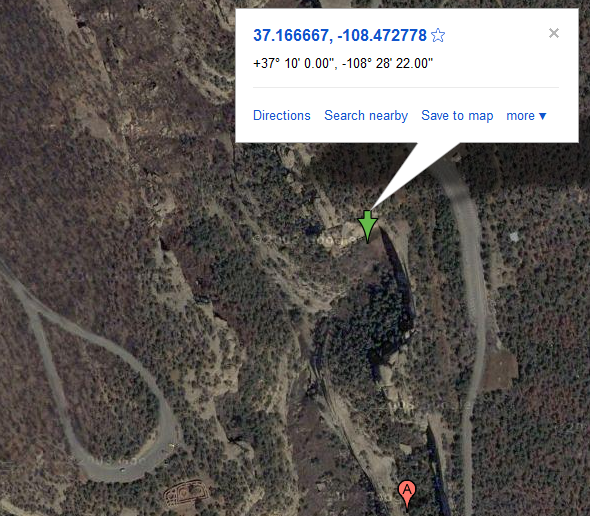 Then, all you have to do is figure out what structure is across the canyon to the west. That sounds as though it should be a simple lookup of a map from the Park Service. 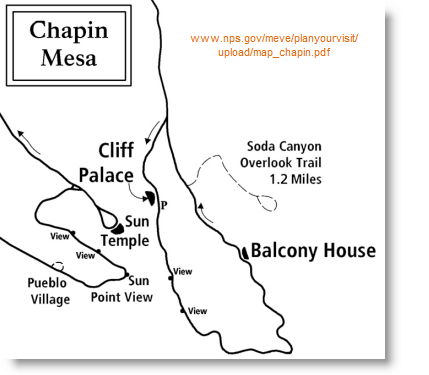 And if you look at the NPS map of Chapin Mesa (the Cliff Palace is located on Chapin Mesa), you'll see that the Sun Temple is just to the southwest of the Cliff Palace. It's just across the canyon (easily perceivable as a canyon in Google Earth). So why did I spend a week thinking about this? The short answer is that I was trying to do something very clever, and got wrapped up trying to understand where the Cliff Palace really really is located. So I went to the 3D Warehouse and downloaded a SketchUp model of the Cliff Palace. And I found a really nice version of the cliff dwelling. 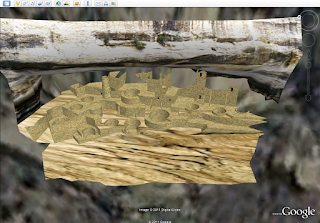 When you open the model in Google Earth, you see a wonderful rendering of the cliff dwelling tucked into the canyon wall. But then I noticed that it seems to be in not-quite-the-right-place. 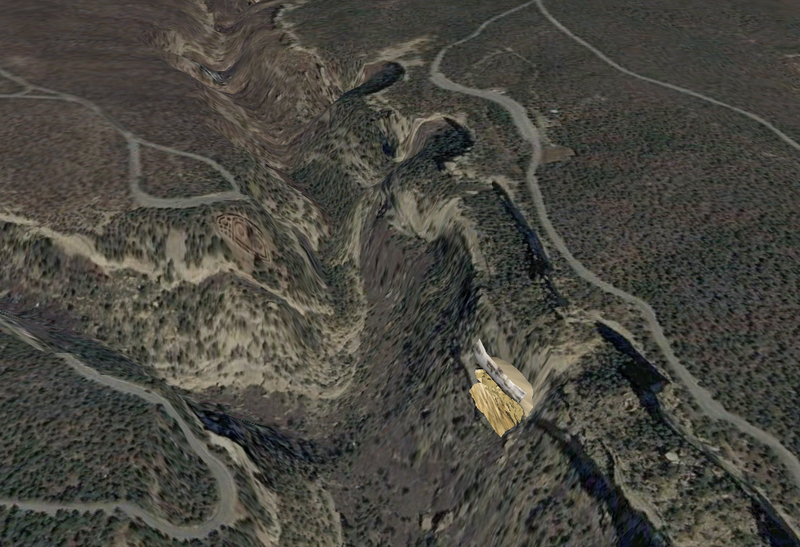 If you zoom out a bit, you can see that the model and the cliff don't quite line up! This filled with suspicion that the model wasn't really right, or at least that it wasn't in the right place. When you rotate up the Google Earth view, you can see that the model isn't quite where the NPS map says it should be. 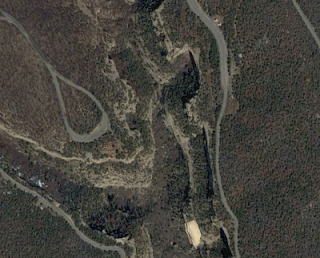 If you look carefully, the parking lot for the Cliff Palace shows up as a wide spot in the road. 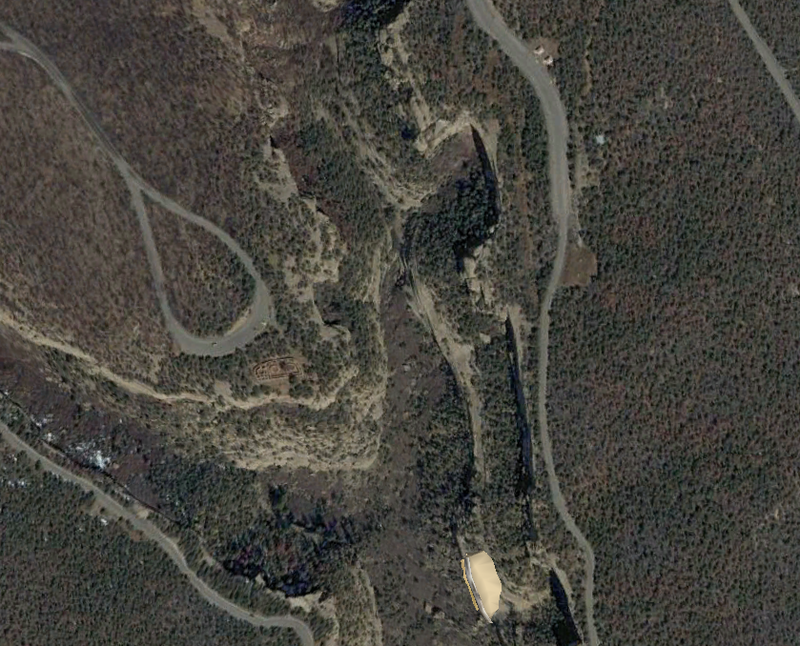 And, it seems pretty clear that the Cliff Palace is tucked into the cliff face immediately to the west of the parking lot. But this makes a great point about research: Be sure to second source everything and double check to make sure all the data you have is consistent. And once I figured out that the Cliff Palace was in the wrong place, I started checking the images of the Cliff Palace I could find with what the model showed... and it's clear that the model is both in the wrong place and not-quite-finished. Okay then--let's move on. So.. back to our problem. Once you know where the Cliff Palace is (see above), it's an easy jump across the canyon in either Google Earth or Google Maps to get a nice pretty high-res image of the Sun Temple. And with this, you can see it's 4 round rooms, with the entire complex done in the classic D-shape of the Anaszi buildings of the time, and probably constructed not as a living place but as a ceremonial structure (hence the name). Lucky that there's no roof--makes counting the round rooms much simpler! 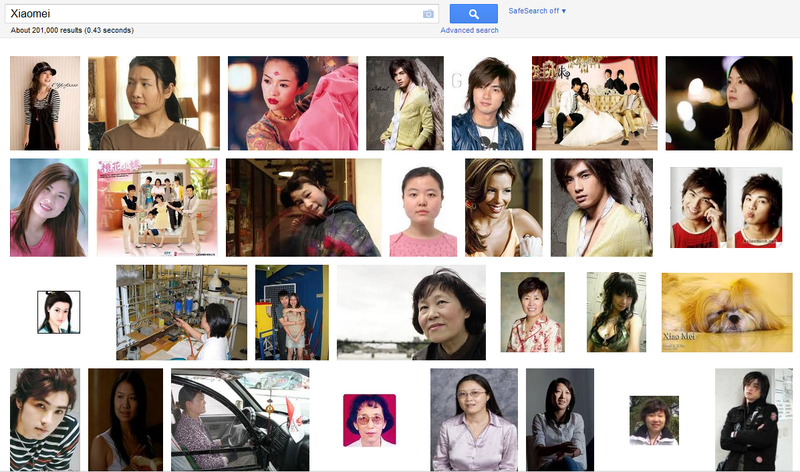 Wednesday Search Challenge (July 20, 2011): How many round rooms? Today's search challenge is a pragmatic one. 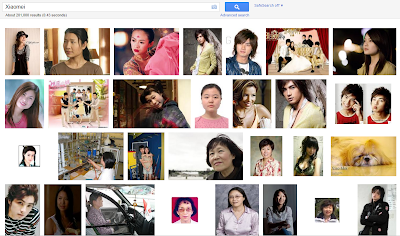 (And not terribly hard for readers of SearchReSearch.) 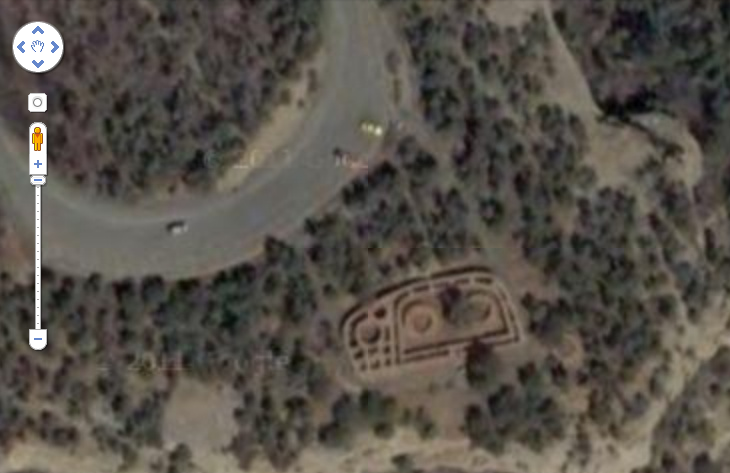 I was curious about something (as is usual for me) and I was checking out classic American Indian building sites in the American southwest. 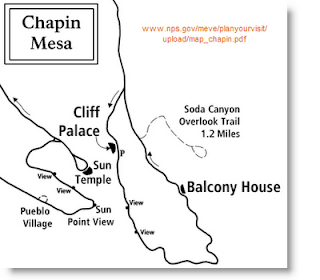 One of the interesting things I noticed was that just to the northwest of the Cliff Palace there is another dwelling built by the Anasazi that is currently--and perhaps has always been--open to the sky. What is the name of this structure, and how many round rooms does it have? In our multicultural world, every so often you'll run across a name that isn't in your culture, and you're not sure if that name is typically male or female. 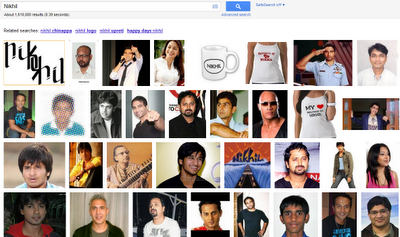 Example: Is the name Nikhil male or female? How about the name Pelin? It's simple enough, but if you haven't seen this kind of trick before, it's well worth knowing. I'll let you try your own search on the name Pat! Answer: Synesthetes do NOT all see the same! Somewhat to my surprise, this turned out to be relatively simple. Questions like this (confirming a negative question) are often difficult to search for on the web. But both comments approached the search solution in the same way... by converting the question into a positive form. will get you to papers (or articles) that are about how consistent the experience is. That's a good move. Another take-away message from this problem is that it's often difficult to accurately assess the difficulty of a search challenge. I know that I've mis-estimated any number of times... both ways. Problems I thought were tough turned out to be trivial; problems I thought would be simple turned out to be intractable. Wednesday Search Challenge (July 13, 2011): Is synesthesia consistent across people? Of all the perceptual phenomena the flesh is heir to, one of the most puzzling and insightful effects is synesthesia. This is the condition where people perceive one property when sensing something else. One common form is grapheme-color synesthesia, when the synesthete (i.e., a person with this condition) sees a letter in particular color. Do all synesthetes see color/letter pairs consistently? That is, if you have 10 synesthetes, will they all see the letter "a" in red? Or will there be 10 different perceptions? For instance would you see it in green, I see it in cornflower blue, while Bob sees it in yellow? Answer: How many planes from SFO / day? Last week I asked a question that should be pretty simple to answer: How many regularly scheduled flights depart SFO (San Francisco airport) on a typical day? When I scanned the results, I quickly find that the FAA has an "ASDI Data Feed," which shows all of the flights that the FAA tracks, and that wouldn't be a bad thing to use, but I only want to do this once from one airpot, not many times over and over, so that seems like overkill. In my reading of the results I also learned about codeshares. 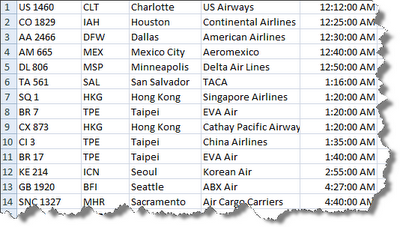 Ah, that's right, any listing of airline flights will have the same flight listed as being from multiple carriers. 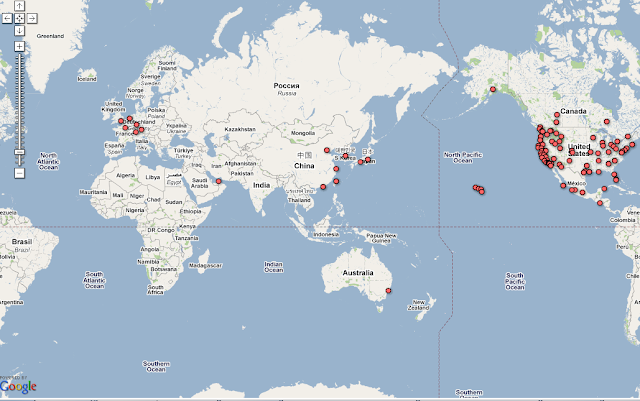 Since I wanted the number of planes departing, I need to exclude the codeshare flights. Don’t want to double or triple count these, so I want to get a singlecode for 1 plane. After then searching for [ SFO flights listing ] I find that FlightStats.com allows you to search for all departures by the hour! 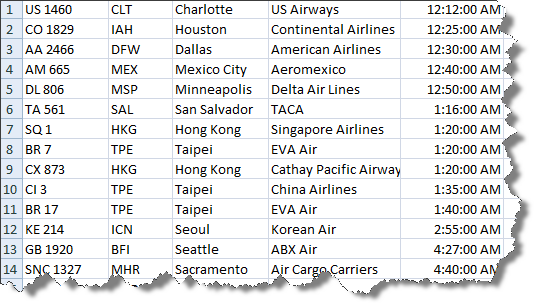 Although it's inelegant (and I wouldn't want to do it this way more than once), I can manually copy/paste all of the departures from SFO into spreadsheet! Luckily, FlightStats also has a "Remove codeshares" button which lets me skip the post-data download step of removing dups. It seems painful, but the truth is that I was able to grab the 18 screen-fulls of data in about 3 minutes and paste it into my spreadsheet. Great! After spot checking to make sure that I really DID have all the flights, and that there really were no codeshares, and that I hadn't accidentally duplicated data somehow, I was ready to go. Finding the number of flights was then just looking at the last row in the sheet: there are 583 regularly-scheduled flights / day out of SFO (at least for July 12, 2011). Interesting, is it not, that there are more flights to more cities in China that to Russia, Africa and Australia combined? And for my last quick look at the data, I computed a histogram to see the number of flights departing by hour of the day. As you can see, it's quiet after midnight, but pretty steady for most of the day. So now you know the quiet times for departures at SFO. I've flown enough times out of SFO to say with some certainty that this is probably right. 1. When you can, get the raw data and do your own analysis. Other people's analyses often contain assumptions that you can't verify (and they might not even explain). Be careful! 2. A really important part of the search analysis process is learning stuff along the way. This is such an important concept that we'll have to talk about it in more detail in a future post, but I wanted to highlight it here. I was reminded about the codeshare problem as I read through the initial search results... and that let me know how to frame my subsequent searches to be more to the point. 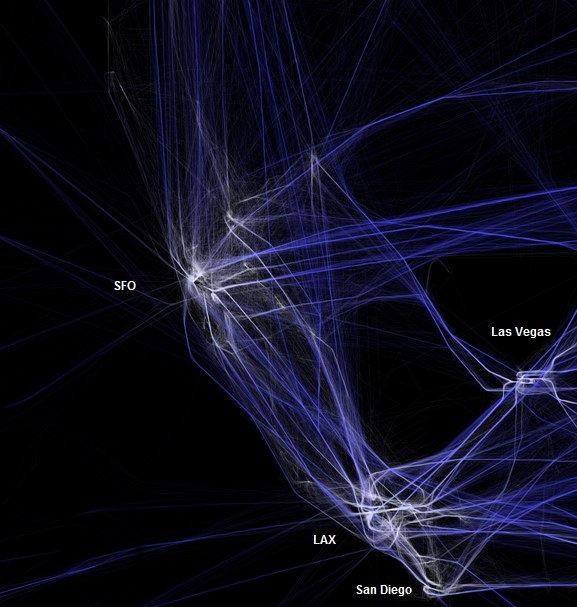 Postscript: I also should mention here Aaron Koblin's wonderful visualizations of air traffic patterns. It's not quiet what I was asking for, but you might be interested in seeing them. Here I zoomed into his flow patterns around SFO. The labels are mine to add a bit of clarity. Wednesday Search Challenge (July 6, 2011): How many planes into SFO? I'm currently at San Francisco airport (SFO), traveling to Long Beach (LGB) for a quick vacation. But now that I'm here, I'm struck that the international terminal where my airline, JetBlue, is housed, seems peculiarly quiet. It looks like my flight is the only one out of here in the morning! depart from SFO on an average weekday? 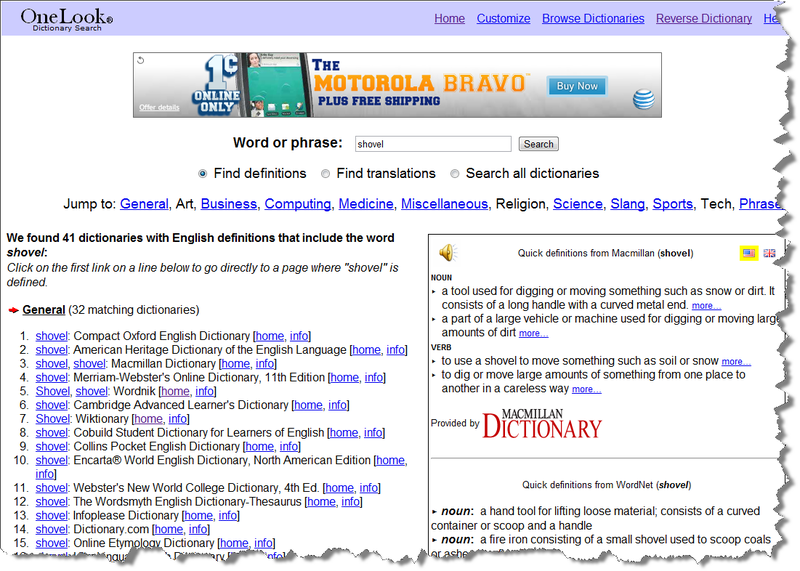 So.... What's a reverse dictionary? 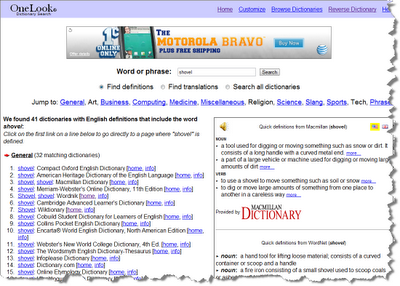 A reverse dictionary is a simple concept--it's a place where you look up definitions and find words. It will often help you rephrase a search query in a way that you might not have thought about, or supply the key term that will lead to success. There actually are lots of reverse dictionaries out there, but I tend to use OneLook because it has a relatively powerful search interface. You don't always need all these search features, but when you do, it's really nice to have. The results are rank-ordered. That is, the best matches will be at the beginning of the results list. Click on the word to verify its definition. The dictionary definitions are arranged according to categories of – General, Art, Business, Computing, Medicine, Miscellaneous, Religion, Science, Slang, Sports, Tech andPhrases. Phrases and slangs sometimes give interesting variations for use in writing. Asterisk (*) equals any number of characters. For instance, search [ love* ] to get all words and phrases like love-bird that begin with "love"
The number-sign (#) matches any single-character consonant. [ ##over ] will match "plover"
Get the full complement of acronyms by using the expand shorthand. For instance,expand:USA. Example: Here I did a search on [ *:shovel ] which is the normal reverse dictionary operation. OneLook shows up a list of words that use "shovel" in their definitions. A great way to look for synonyms and related concepts. 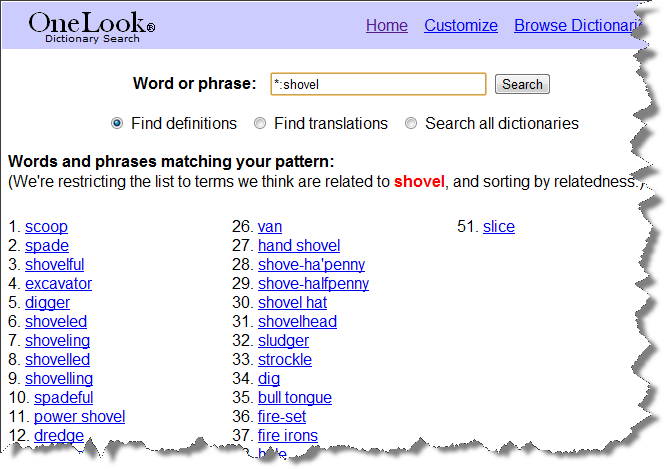 Example: Here I did a search on [ shovel ] giving just definitions from a wide variety of sources. There are more tips in the Help section of the OneLook website. Searching on... at the word level! 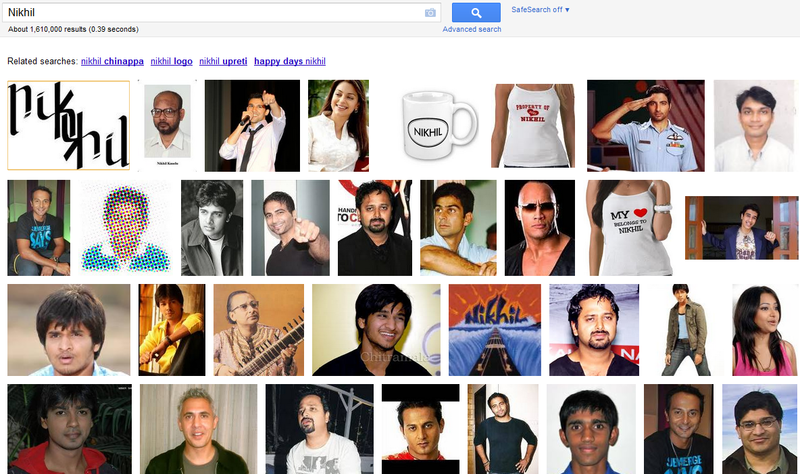 Search on... even on other search engines!